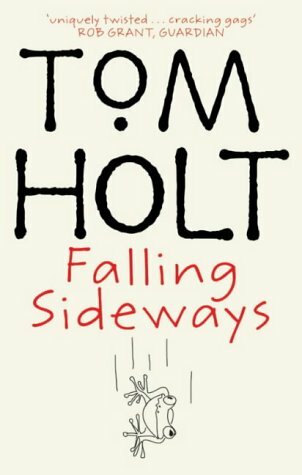 Tom Holt is one of the masters of comic fantasy, and as the author of thirty novels in this genre, you've got a wide variety to choose from. His only real ongoing series, however, is the J.W. Wells company books, which make magic... rather corporate, and absolutely hilarious. Photocopiers that can only be worked by the seventh son of a seventh son? Always gets me. His books typically end in a convoluted confusion of plot - there might be holes, but it's always funny. However, his characters aren't as differentiated as some of the authors I prefer - several of his male protagonists seem to merge after a while, so if you're inclined to focus on character rather than comedy... Well, you'll still enjoy his novels, but perhaps not quite as much as otherwise. Rankin, on the other hand, is on the side of the spectrum that can be rather aptly named 'insanity'. Books are a hilarious confusion of running gags, plot twists made solely for laughs, and a 'fantasy kitchen sink' Earth in which anything can happen, and unlike many books, it frequently does. I mean, accidentally murdering the zeitgeist of the 60s with a client's brother, recently transmuted to gold? If you're not up for many, many running jokes, though, Rankin is not for you: they're everywhere. From finding zodiac signs in the streets of Brighton, to locating a pit to hell under a Brentford kitchen floor, Rankin is most probably the craziest writer alive: and if you're at all like me, you'll love his novels for it. Read these books, or have any suggestions for others I could add? Comment below and tell me! I love Pratchett but find Rankin a bit hit and miss; I didn't like his early books at all, I found them a bit blokeish! Loved the two set in Toy Town though. Hm, I haven't read those - you might be right about Rankin, though. When he's in his stride, he's hilarious, but there are novels where he misses his targets as well - for me, the earliest books in the Brentford trilogy aren't nearly so good. Have you tried Tom Holt?